Home » Blog » Other ARTiculations » Connecting and nurturing friendships through social media. Connecting with you in my online journey. Warning! This is a rather long post, even for me. And for once, it isn't all about art. Depending where you are in this world, you might get yourself comfortable and have a cup of coffee or a glass of wine in hand before reading this post. Or save it for later if you are pressed for time...just saying! Last year, before I left for a vacation in Spain, I told one of my Instagram friends that I was going to be in Torremolinos. She would be in Estepona at the same time, just a little further south of us, and we agreed to meet in Marbella, a city along the Costa del Sol, about halfway between both of our locations. Although we had never met in person, it felt as though we had done this before. In no time we were talking about our families and our routines back home. Lunch transitioned into an afternoon chat at a little seaside cafe. Our time together was the highlight of my trip! During our time together, we discovered that we had many of the same circle of online friends, none of whom we had ever met. Our art was the first link that connected us, followed by personal messages, and sometimes emails, and friendships evolved, and the circle kept growing for each of us. In September, I will meet another such friend in Vancouver, and we will spend several days together as we travel to Seattle. Similarly, we have never met except through our common interests on social media sites. Over six or seven years, we have encouraged each other in our artistic endeavours. Yes, we have done that quite a lot. Online friendships imitate real life friendships. But more than that, we have shared life’s ups and downs, and we have trusted that, even though we are miles apart (she lives in Australia), the bond we have is more about the joy in meaningful conversations as we get to know each other than it is about art. In many ways, the relationships we have with our online circle of friends imitate those in real life. There are friends in whom we confide because we share the same values while there are others who give us strength through their insights, or because of the goodness of their hearts. Some friends are in our lives a short time, and then are gone. But we know where to find them, and it is always easy to pick up the conversation where it was left off. And then, there are the really special friends that we hope to meet and get to know in person. My life is enriched by many online friends. Although blogging is really "monologuing", it is a most personal way of communicating with friends who share an interest in art or who are curious to see what is happening in my life. On my blog, friends see the most recent work I have completed, they can read about my frustrations, if there were any, and there often are...so blogging allows friends into my world for a few minutes each week. Blogging as artist, helps me to see patterns emerging over time, to verbalize a process. However, it might also help others to avoid some of the problems I encountered or encourage someone to try a new technique, or to keep going through the ugly stages of an art work. At least I hope my posts have that effect! Publishing posts regularly is beneficial as a visual diary. Art is all kept in one place; I can easily see the progress I have made. Even though I cringe at some of the earlier art, I am proud that I have continued in spite of the many pitfalls along the way. My very first blog post in May, 2015. While many people curse Facebook and have decided to leave the social media site, Facebook is important in establishing connections. Certainly, if Facebook is not managed properly, it can be like going down a rabbit hole: a lot of time can be wasted there. But with some restraint, Facebook is a great way to grow as an artist, and to find specific interest groups. Instagram and Pinterest do not yet hold the same cachet as Facebook does for me presently. Neither of those two social media sites encourages the types of friendships that are possible through the various groups in Facebook. Art is a means to an end, just not the end I expected. Last fall, while I was on my way to Croatia, my suitcase was diverted to Paris rather than to Amsterdam. Who should come to my rescue? An online friend from Holland who told me where I could shop nearby to find reasonably priced replacements for everything in my luggage. Thankfully, the luggage was returned before the next leg of my trip. That is how friends help each other. While art initially allowed us to find each other, our online presence enables us to live each other's ups and downs, and to help each other when needed. We shouldn't scoff at that type of connection. After all, isn't that what friendship is all about? Being there for one another? Through my blogging and in my newsletter especially, I am nurturing my own circle of friends: I want to encourage the growth and development of other creatives. For instance, I highlight the work of artists who have joined my circle, and others who have stayed on the periphery, looking in. This is a connection with other creatives that I cherish. Each month, I feature two guest artists on my blog. Some artists have websites of their own, but most don’t, so it is a way to help them grow their circles of friends too. Every now and then, I offer suggestions for journaling, for sketching, or for other art related projects. Admittedly, I feel overwhelmed by the work I see other artists accomplishing. Honestly, some artists must never sleep! They host podcasts, offer hour-long video tutorials, sell their art in online auctions, etc. At times, I have felt as though I am swimming against the tide. So my means of connection has always been a bit old-fashioned: engagement through conversation. My conversations with you in my blog posts and newsletters. Once a month, I send a newsletter to my loyal subscribers. This past year, I have included two ebooks: one contains vintage portraits I painted in 2018 along with the stories I wrote for each portrait. The second ebook is a travelogue of our trip to eastern Europe, also in 2018. The ebooks represent a big learning curve for me. At first, I locked myself out of the first ebook and then I lost it (how does that happen?) and wasn’t able to recover it on time for my own pre-set deadline. And so, I had to start over. The second ebook was so much easier. I guess by then, I had learned a few tricks. My subscribers have received tutorials on painting autumn leaves similar to the ones pictured below, and projects for little hands to make (March 2019 newsletter). I have also had many giveaways only for my subscribers. The most recent giveaway was an 8 X 10” giclée print, but I have also given away an angel, wood slice art, cards, zippered pouches, a ceramic Delft pottery container I bought in Amsterdam…All these little gifts as well as discounts on art work are found in exclusively in my newsletters, nowhere else online. And as my circle of friends grows, we are now sharing our work in other ways. A few months ago, I suggested that subscribers share any work they might have containing flowers. Wow! What an overwhelming response! I have received so many wonderful photographs and paintings and embroidery of flowers. It will be a challenge selecting the best ones from some subscribers who sent me more than two photos. Below are some of my own favourite photos. April Flower Explosion, is a community event only for subscribers to my newsletter. I am creating a safe place for my friends to share their work. A community, much like friendship, is built over time. In creating that feeling of connectedness, we are in fact, opening our hearts and sharing our gifts with each other. 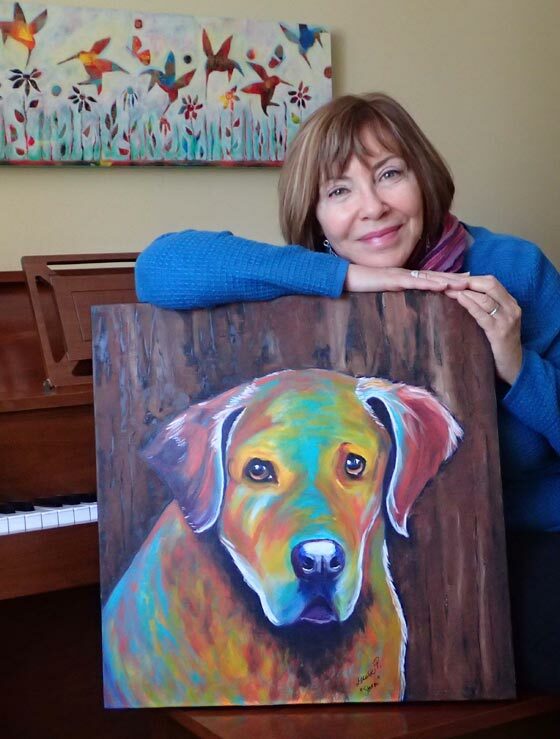 Pet portrait artist, Louise Primeau, with Chesapeake, "Storm". Thank you, all my amazing friends who are sharing this journey with me. Won’t you join one of my communities? Subscribe to my newsletters or subscribe to receive my blog posts. Join me on my Facebook page or on Instagram. I would love to hear from you and add you to my circle of friends! Really great post Louise – This post really resonated with me. I have to say that many of my closest friends are other artists I have met online, specifically through facebook. I have friends who are not on facebook and some seem to have this impression that the people on the other side of the screen are ‘not real’ and that the friendships are somehow not real either. That is for sure not the case. I have been on several art retreats and vacations with people I met through facebook. I am old enough to remember having had pen pals and Facebook friends remind me a bit of the way I felt when I received letters from Japan, Germany, and France. Over time, and many letter exchanges, we got to know each other. I met one of my pen pals ten years ago and to this day, she is not yet on facebook. When all we hear are negative aspects of social media, I think of its positive side, at least for me and it seems, for you as well. I am glad to have met you through our facebook group! Best wishes, Tom.